Game 1 of the Eastern Conference Finals was one that every basketball fan fantasizes about, every possession just as critical as the one before it, a game that was won at the buzzer. Overall, this was a great game that went into overtime and was a battle from start to finish. The first half was tightly officiated, which was disturbing to many of us. The officials were tight with the whistle, calling a total of 22 fouls during the first half alone. Of the 25 turnovers (Mia – 13, Indy – 12) committed in the first half, eight were offensive fouls. Miami fans were on their heels at the end of the first half with LeBron James having nine points, Dwyane Wade with six points, and Chris Bosh only two points and zero rebounds. Ending the half with the Pacers up 42-37. The tale of two ½s, Miami started the second one on a 12-2 run. The Heat scored the first six points in the third quarter before Paul George made a shot on a drive to the basket and dunk. For Indiana, Tyler Hansbrough played well and provided a spark off the bench. Hansbrough was good on the boards, picking up loose balls around the rim and finishing them, finishing with 10 points on 5/8 shooting, 6rebs. Miami’s free throw shooting was frightful down the stretch, Ray Allen (89.4% FT shooter) missed a clutch free throw in the fourth quarter that could have been a difference maker of the game. Miami shot 64% from the free throw line. Going into this series we knew that Miami had to rebound for them to win this game and ultimately the series. Despite winning this game, they were outrebounded 43-38. 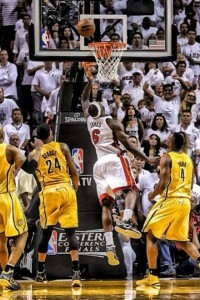 Chris Bosh wasn’t effective on the boards, Bosh’s second rebound of the game came in overtime and it was a very big one! Bosh’s rebound came on the offensive boards with a put back and a basket that tied the game with 49 seconds left to play. He could not have shown up at a bigger time than that. Chris “Birdman” Andersen was big off the bench for Miami, with 16 points on 7/7 shooting and three blocks in 18 minutes of play. Miami’s bench outscored Indiana’s bench 25-18. David West had a solid game with 26 points, Paul George contributed 27 points, and Roy Hibbert assisted with 19 points. Dwyane Wade (19points) fouled out which left the load to be carried by LeBron James to will the team to victory and that’s what he did. LeBron James with his triple double (30points, 10rebs, 10ast) scored on a lay-up at the buzzer to give the Miami Heat a 103-102 overtime victory over the Indiana Pacers.